A United Airlines flight experienced engine failure shortly after takeoff on Wednesday and was forced to make an emergency landing, according to multiple reports. According to a report by USA Today, one passenger on the flight documented how a “large banging noise,” could be heard right outside the windows and how numerous passengers immediately became worried. United and JetBlue Airways have also experienced separate scares since last Sunday. 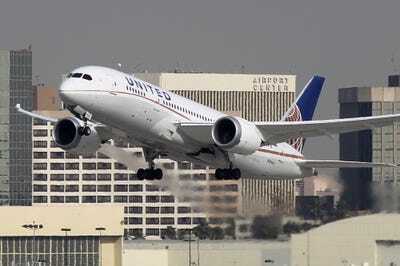 According to data provided by FlightAware, United Airlines Flight 2397 took off from Fort Myers, Florida at 12:12 p.m. on Wednesday, but turned around shortly after takeoff and landed back in Fort Myers 45 minutes later, having originally been scheduled to arrive in Newark Liberty International Airport that afternoon. But the details told by those onboard Flight 2397 paint a much more harrowing picture. According to a report by USA Today, one passenger on the flight, Cliff Maloney, documented how a “large banging noise,” could be heard right outside the windows and how numerous passengers immediately became worried. “And then, all of a sudden, you hear the engine. There’s not enough sound or power,” Maloney said to USA Today. Maloney told USA Today that the pilot came onto the intercom shortly thereafter to make an announcement. According to Fox News, the flight landed safely without incident and after an inspection by the fire rescue team, all 79 passengers de-boarded, with several being placed on different flights to Newark. This is just the latest aviation incident for domestic carriers in the last week and a half. On Tuesday, October 2, a United Airlines plane flying from Los Angeles to Sydney, Australia, made a mayday call and safely completed an emergency landing after the pilots realised they were running low on fuel. Then on Sunday, October 8, a Boston-bound JetBlue Airways flight from Las Vegas experienced a scary moment when the plane had to be evacuated just before takeoff because of smoke pouring out from its right engine, with one news outlet reporting a blown tire and engine. In each incident, no passengers were hurt. Below is a photo posted on social media by Maloney with the captain for Flight 2397, who Maloney later identified on his Twitter account as Edward Kennedy. Life is so damn precious. This guy, with 1 engine without power, brought us down safely.